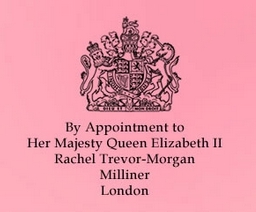 Some of you may be aware that British milliner Rachel Trevor Morgan was recently granted The Royal Warrant of Appointment to Her Majesty The Queen. This great honor is most deserved and I am certain many readers here will join me in wishing Rachel our sincere congratulations. As we send our congratulations to Rachel today, I wonder, dear readers, which one of her royal hats is your favourite? This entry was posted in All About Design, Great Britain and tagged Autumn Phillips, Countess of Snowdon, Countess of Wessex, Duchess of Cambridge, Princess Alexandra of Kent, Queen Elizabeth, Zara Tindall. Bookmark the permalink. I love the watermelon hat so much! My other favorite hat is Autumn’s hat – would look good on Camilla too. My only quibble is that Serena Linley always dresses like a middle aged woman from the ’50s. She’s far too young to look so prim and buttoned up. I remember when she wore Leger’s bandage dresses not that long ago. I have never seen that photo of Kate and that silvery gray hat is amazing! I didn’t realize that Rachel Trevor Morgan had made hats for so many other royals. I would love to ask: What is Rachel’s design method for producing such consistently good yet diverse designs? Rachel Trevor Morgan and Stewart Parvin create unified looks for Her Majesty that are stylish and modern without loosing that aura of traditional styling that, if we’re all honest, none of us want to see her loose. The hats are much to fussy for my personal taste but they are perfect for Queen Elizabeth. I wanted to add a comment about the others- the wide brimmed picture hats are also perfect for Princess Alexandra and that ruffled black saucer hat is utterly fabulous on Sophie. The hats here show what a versatile and talented milliner Rachel Trevor Morgan is. HM’s watermelon rose hat is such perfection it is in a class by itself. Of the others, the purple with white-ish flowers in the last quartet for HM and Autumn’s hat for the rest of the royal ladies. These are all lovely hats although I personally don’t favour the side platter style. I particularly like the way that the Queen’s hats complement and complete her outfits. She wears the hat it doesn’t wear her and she (invariably?) wears the right hat (and outfit) for the occasion. In my opinion it’s a balance that other royal hat wearers could learn to their advantage. A flamboyant topper is a wonderful thing but for me when the emphasis and attention is on the hat and not the royal person it’s a fashion faux pas. Chapeau RTM! All of these are among Queen Elizabeth’s best hats. They are all so different from each other, but each is exquisite, and almost all go perfectly with the outfits for which they were designed. The one exception is the bright purple with black: in sunlight the purples always seem to clash. I also very much like the bright blue hat on Princess Alexandra. Every one of these hats is exquisite and looks so flattering on the person who is wearing it. I have tried for the last hour to choose my favorite but I just can’t. You might think the Queen’s hats are all the same but they all have some individual personality. Brilliant! My favourite isn’t mentioned here- Sophie wore one of Rachel’s pillbox hats (navy I think) years back and looked fab. I didn’t realize that RTM made the straw picture hat that Autumn Phillips wore to Zara’s wedding (second row, middle picture). That hat is one of my favorites of all time. What I notice with all these hats is that I don’t like all of them, they all look amazing on the person wearing them. I don’t like sideways saucer hats but the two on Kate and Sophie look great. Best milliner for the royals by a mile for me. And the pink hat with lavender knot on it for the Queen is one of my favourite hats ever. It’s conforms to all the rules but has a cheeky fun about it that makes me smile! A very well deserved honor to Rachel Trevor Morgan! I think her hats are lovely and suit HM in particular very well. Of those you have pictured my very favorite of HM’s is the first watermelon pink with the rose. That rose! Sigh and swoon. Of those pictured on the other royal ladies, I am responding very well to Princess Alexandria’s blue and the picture hat Autumn Phillips wore to Zara’s wedding. I hope we continue to see more of this very talented milliner for many years to come! She makes some very regal and elegant hats. I also love that pink rose hat. It is so simple but so gorgeous. I also love that hat! My other favorite is the pink hat with the green leaves and dark pink flower. All of these hats look so good on Queen Elizabeth. These are all good. One of the best is the very first. I also love that she tried and accomplished an orange hat – not easy to do. Every one of these hats on the Queen is a beautiful hat. I prefer the Queen in bright pinks and blues but even the white hats are very beautiful.